Acrylic, also known as Plexiglass, is an increasingly popular and growing request for sign materials inside offices. 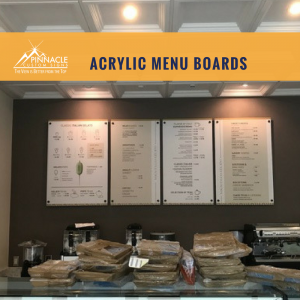 From upscale professional settings to swanky restaurants and hotels, acrylic is becoming a relied on sign material for CEOs and business owners alike. Acrylic provides a professional appearance. The shine of the plastic offers a more classy, professional look that business owners enjoy in their office environments. The high gloss exterior offsets and enhances the well-designed logo. Acrylic can be chosen as a color or used as a clear or frosted backing. These signs can create a lasting impression on any client. Acrylic can be relatively inexpensive. Acrylic indoor signs are actually quite affordable for the impressive look they provide. The material helps convey an upscale atmosphere but the price doesn’t break the bank. So, compared to wooden signs, acrylic can be an affordable material choice. Add a specialty finish to acrylic. Specialty finishes are available for acrylic. 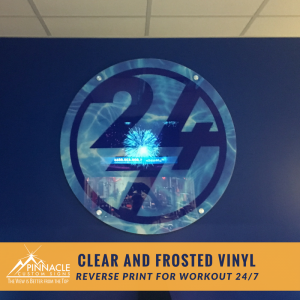 Adding a metal finished backer to the clear acrylic that showcases a brushed or mirror finished through the clear surface can add a touch of class to signs. Using colored vinyl lettering applied to the front or back of the acrylic can add a distinguished effect. Acrylic signs are typically mounted with polished or brushed hardware called “standoffs”, which give custom signs a very professional look. Standoffs literally make the signage “stand off” the wall with front mounted screw caps that add to the professional effect. When combining acrylic with either gold or silver hardware to mount your acrylic signs it provides a very refined and impressive appearance to clients. Acrylic can be custom cut to virtually any size and any shape which includes creating contour cuts to match your logo. Creating beveled edges or lighting to your acrylic can add a dimensional effect. Acrylic is not recommended for long-term outdoor use. When placed in direct sunlight, acrylic can bow or bend due to the heating of the plastic. Acrylic signs are perfect for mounting inside to increase brand awareness and edify the high quality of your services to your clients! 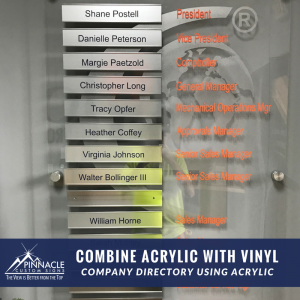 Pinnacle has done many variations of signage using acrylic. 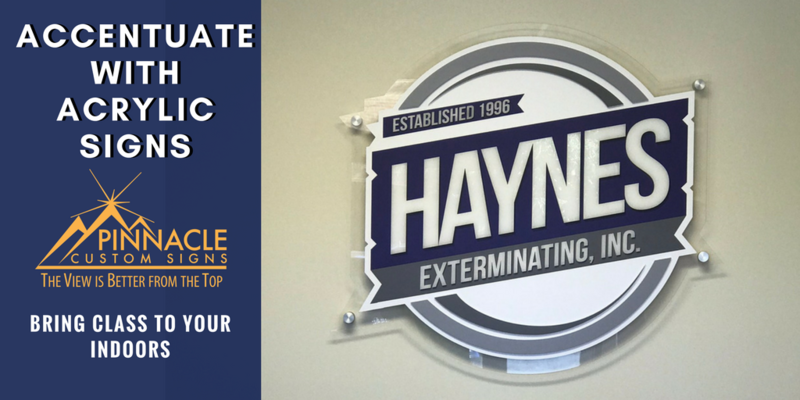 Our in-house equipment allows for our team to provide custom cuts and engraving to ensure that your indoor signage reflects your corporate culture. By incorporating the existing company logo, colors, and branding to an acrylic backing and offset hardware, we can create a dynamic look. 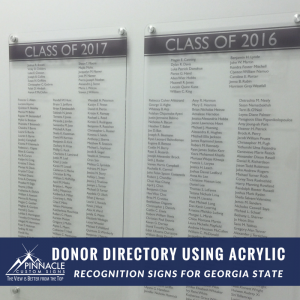 Many of our clients have gone beyond using acrylic for traditional logos to creating office directories and name boards for their companies to display in high traffic areas, such as their front lobbies. The acrylic looks provide our team a dynamic canvas when paired with vinyl or dimensional lettering. Our design team can help you transform a standard indoor lobby sign into an entirely new work of art when combining it with acrylic. Pinnacle is always here to provide complimentary consultations for any sign related project. 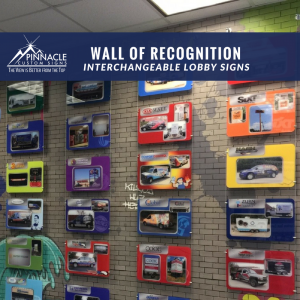 If you have thoughts on creating new lobby signs, adding more corporate class to your existing lobby sign, or transforming your indoor signage in a completely different way — give us a call to discuss your future project.